Free Sms - Microsys Software Solutions (Pvt.) Ltd. Send free SMS and free MMS worldwide without registration. 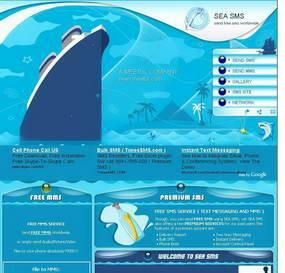 SeaSms.Com is probably the most simple way to say hello to a friend. Just visit the website, type your message, the destination number and Send the SMS. No Logins / No Registrations. Also, you may select from a gallery of thousands of pre-defined Cool SMS. Just click the "SEND" button besides the SMS that appeals you and it will be delivered within no time. Sending MMS cannot be simpler, probably, that made us number 1 in Google Search results when searched for "Free MMS". Just upload the picture/video/audio/file that you wish to MMS, enter the number and click on SEND. The most simple, yet powerful means to communicate with your offline friends. Google PR: 3 | #1 in Google for "Free MMS"
i) Registration is NOT required. ii) Ability to send MMS.